It finally stopped raining in NYC today after what seemed like a stretch of weeks & we spent most of the day outside remembering how magical this city is when Mother Nature shines. Tomorrow we’re headed to Albany with the Poor People’s Campaign’s 40 days of moral action to stand witness to the intersection of racism, poverty & voter suppression. 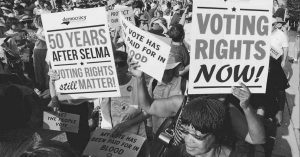 There are fewer voting rights in 2018 than there were 50 years ago when the Civil Rights Act & Voting Rights Acts were passed. “Tough on crime” politics has led to increased policing of poor communities and a tenfold increase in annual federal discretionary spending on prisons since 1976. You can’t vote if you are in prison. *From The Souls of Poor Folk, an Audit by the Institute for Policy Studies. I’m still reveling in the black magic, feminism & social justice themes of the Royal Wedding & am so energized by that historic union & ceremony, but I am also very aware that there is much work to do towards full racial & economic equality, and that my family & I have a lot to learn. Learn more about voter suppression, gerrymandering & how their roots in racism are controlling our democracy with this compelling article. The Karios Center, ACLU, and Repairers of the Breach are also good sources as well as the Audit cited above. 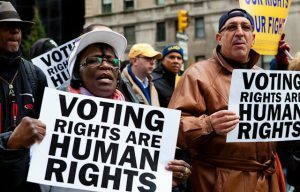 Again I ask: Do you believe that voting is a fundamental human right? If so, let me know how you’re combatting voter suppression in your community.